We moved to this old house ten years ago. 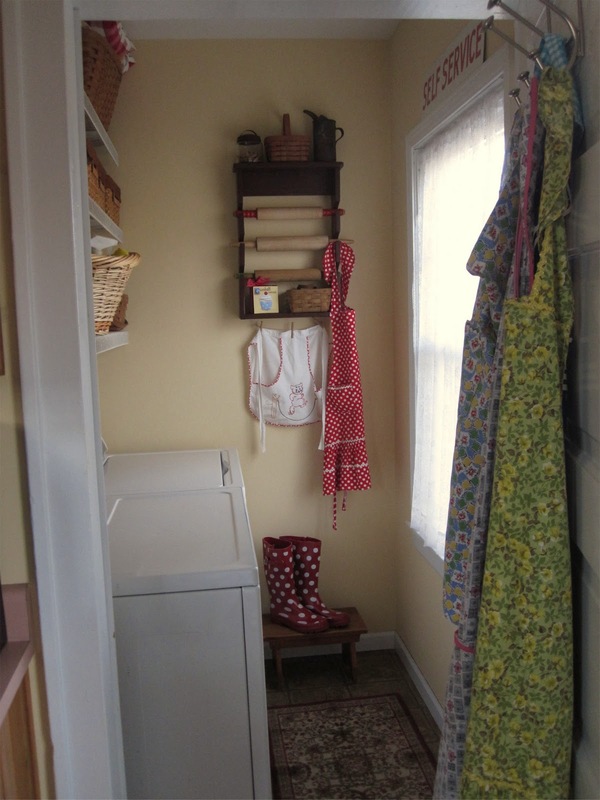 I love the charm of an old home, like this laundry shoot. What I didn't love was having to go to this creepy damp basement to do my laundry and then pack it up two flights of stairs to the bedrooms. One of the first things we did was change the large pantry into a laundry room so that I would only have to pack the laundry up one flight of stairs. I hated having to give up this great pantry because I'd dreamed of a pantry like this with great organized shelves of food and dishes. I'm not the best photographer in the world so I'm sorry for these photos, but it's a tiny room and hard to photograph. 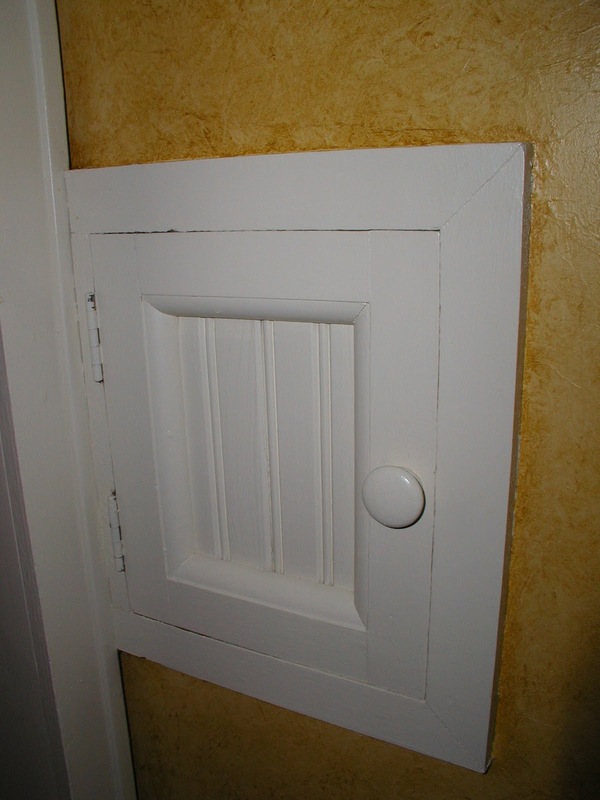 Now the room is a soft yellow (the same color I recently painted the kitchen). My collection of aprons hang on the old pantry door. This room is much more cheerful now! I'm not crazy about this shelving, but it was here when we bought the house and works for now. 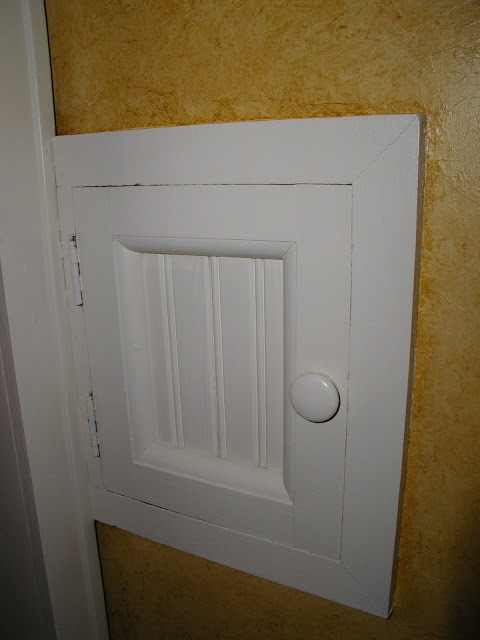 I would love to have some old cabinets someday. My porch pillows are stored in the basket on top and I can grab them easily to take outside when the weather is right. 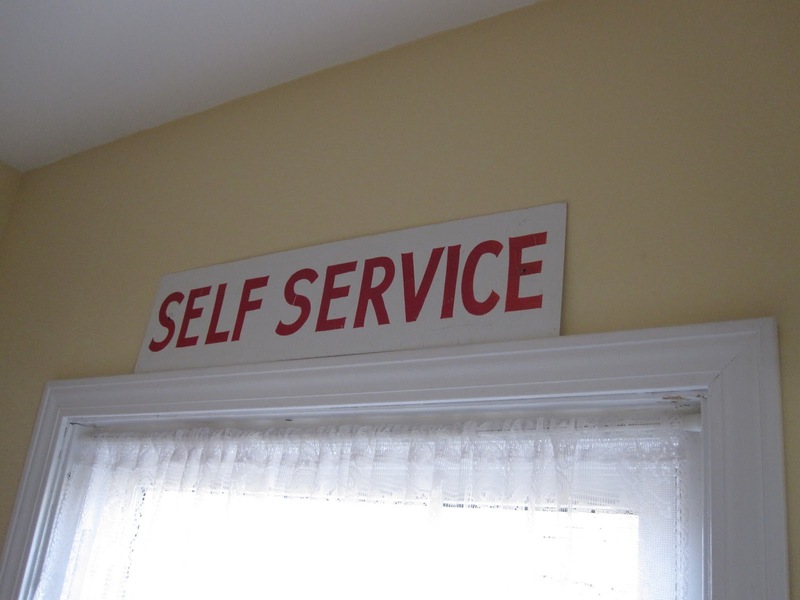 I moved my old gas station "self service" sign to this room because it seemed a little insulting in the kitchen. I thought my guests might be a little intimidated by it. I plan to make new curtains soon from tea toweling material. Now for a confession. I won this adorable rolling pin holder from Carol at Firecracker Kid Primitives quite some time ago and never blogged about it. I tried to take photos of it to share but everytime I took a picture the flash bounced off the shiny wall. When I tried taking a photo without the flash the rolling pin holder didn't show up well against the dark wall. Now it's the focal point of the wall. Please check out her blog and her Etsy Shop. 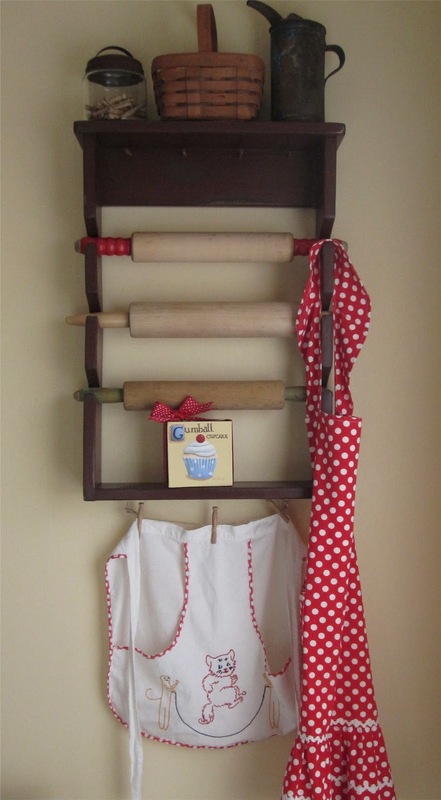 This little apron hanging below the rolling pin holder was made by Grandma Chickie and she made it when she was very young. Notice the great red and white polka dot trim around the edges! It goes perfect with my polka dot apron and matching boots! I'm sure she wore this to hang up clothes because I think the pocket was for clothes pins. I'll share more when the curtains are finished. It looks wonderful Cathie! I love it. I need to decorate my laundry room. It is on my projects list this year. You have given me some incentive! Love the red polka dot wellies! 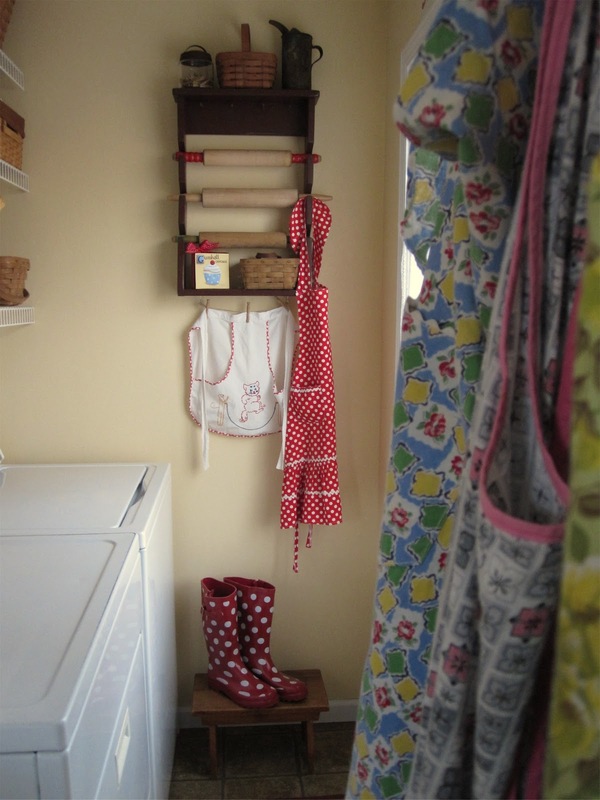 I love everything about your laundry room-the color, the baskets, the rainboots. I'm crazy about aprons and yours are the cutest--especially the one your Grandmother made; how touching to have that piece of her life nearby. Looks great mom!!! Can't wait to see it on Thursday. Oh it is sweet! 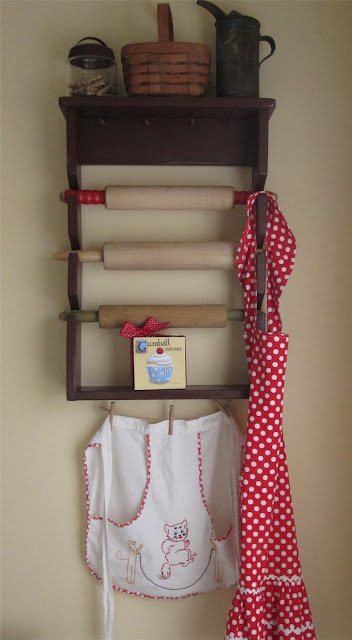 What a wonderful win your rolling pin shelving is. It's wonderful to see all your special aprons around and everything looks so fresh and organized. It can't be much of a chore to work in that darling room. I love it. I gave up my main floor laundry room for a hall closet. With the four of us, a coat closet was VERY needed, but I'm always threatening to bring it back so I don't have to haul that laundry up 3 flights of stairs. I'm getting old. It looks fresh and sunny ! Cathie, it looks so nice and cheery! Mine is so small and I can't do much with it. Love your aprons! Ah that is really a difference. I like the self- service sign all all your little details. We bought an old house 6 years ago and it seems we will never be ready with the makeover of iz. Gorgeous! a room you want to do laundry in ! 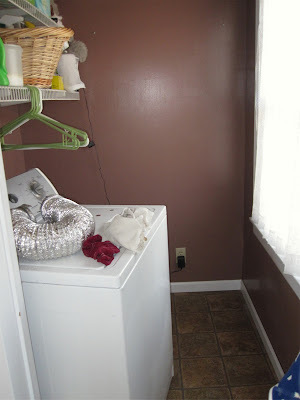 Cathie, I just love, love, love your laundry room makeover!!! The polka dot wellies are a favorite of mine too! Hi Catherine:) I love the old homes too. 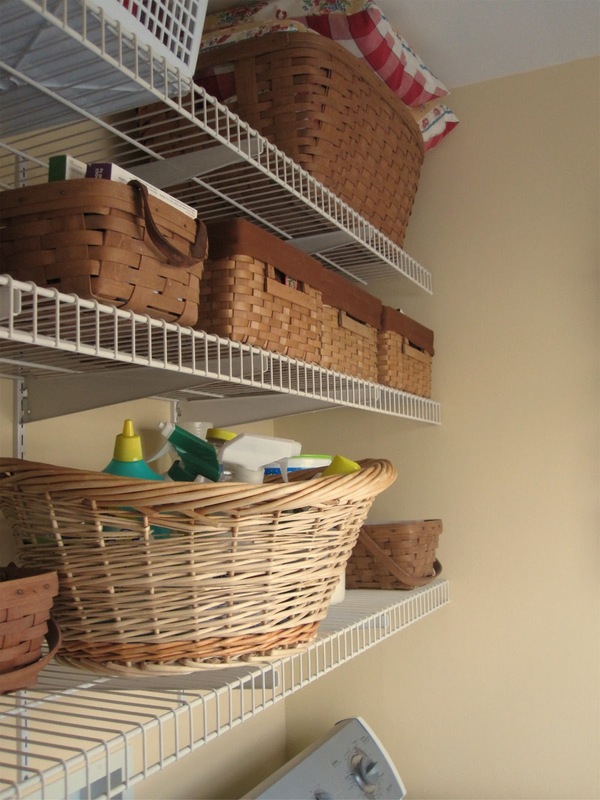 You've done an exemplary redo on the pantry making it into your laundry room. I love how your rolling pin keep vignette fits in and how it compliments the room with the rest of your treasures. Nicely done gal:) Thank you for sharing! Now there's a room that could bring a little joy to laundry chores! So many wonderful and homey touches and the pin rack is fabulous!! I'm in on an Etsy team with Firecracker Kid and I so had my fingers crossed for that rack! I'm glad you put it to such good use. I love your laundry room makeover! Your laundry is exactly like mine the shelving, w & d, and the window are in the same location. I love how this turned out. Very cute! I need to blog about some wins also. Thanks for linking up!